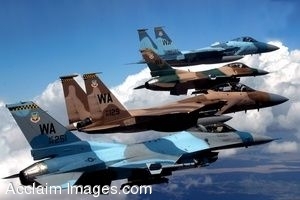 Description: Clip art photograph of a flight of Aggressor F-15 Eagles and F-16 Fighting Falcons fly in formation over the Nevada Test and Training Ranges. The jets are assigned to the 64th and 65th Aggressor squadrons at Nellis Air Force Base, Nev. The F-15's superior maneuverability and acceleration are achieved through low wing-loading (the ratio of aircraft weight to its wing area), which is a vital factor in maneuverability and a high thrust-to-weight ratio, which enables the aircraft to turn tightly without losing airspeed. The F-16 can fly more than 500 miles (860 kilometers), deliver its weapons with superior accuracy, defend itself against enemy aircraft, and return to its starting point. Clipart photograph by Department of Defense Public Domain.